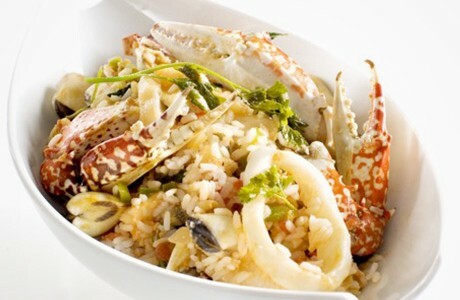 This delicious recipe, featuring a selection of fresh seafood paired with Carolino rice, is a Portuguese favourite. This simple to cook version is great value and ready to serve in only 25 minutes. Heat 3 olive oil tablespoons in a large saucepan over medium-high heat. Add the onion and saute for 2 minutes. Add the green pepper, half the garlic and parsley, cook for 1 minute. Add the tomatoes and chillies, simmer for 5 minutes. Add the carolino rice and mix well. Add wine and simmer until it evaporates. Add the crab legs and the hot broth. Simmer 10-15 minutes. Meanwhile, heat the remaining olive oil in a large skillet/pan over medium-high heat. Add the remaining garlic and cook for 1 minute. Stir in the remaining parsley, bay leaf and cuttlefish. Simmer a few minutes. Stir in shrimp, clams, mussels, crab legs and the remaining wine. Season with salt and pepper to taste. Increase the heat and cover. Cook for a few minutes until the clams and mussels open. Remove from heat and let stand covered. Remove any clams or mussels that have not opened and discard. When the rice is ready, add the fish and the sauce on top and mix. Add the butter and fold gently. Taste and adjust seasoning if needed. Serve sprinkled with more salsa if desired. Serve immediately.